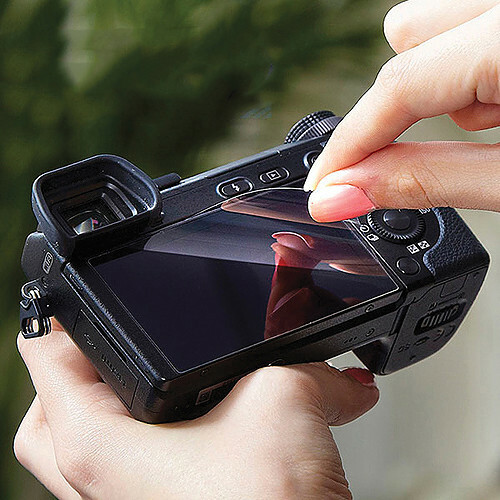 This Anti-Glare Screen Protector from Expert Shield safeguards your Nikon D600/610 Digital Camera against scratches, dirt, and debris. It's pre-cut to the exact dimensions of the monitor to ensure a perfect fit. The thin protector's silicone gel layer allows it to cling securely to your screen without leaving a sticky residue behind. It is easy to install without trapping any air bubbles, and is just as simple to remove. Hard but highly flexible optical grade PET plastic with a durable scratch-resistant coating offers high clarity with no distortion. The top layer of the protector is also crafted from an extremely clear, durable plastic, adding one more invisible barrier against damage. A matte finish offers a significant reduction in reflections and glare with no more than a very slight reduction in overall clarity. The protector is washable and includes a lint-free cleaning cloth. Box Dimensions (LxWxH) 6.25 x 3.75 x 0.1"